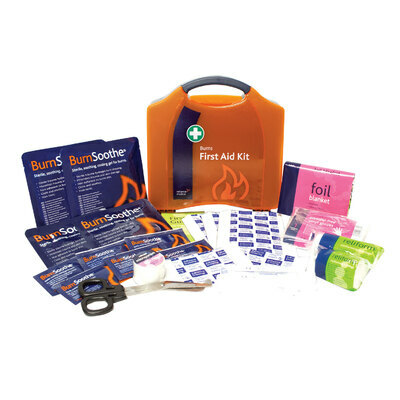 Be prepared for minor emergencies and injuries with our Burns First Aid Kit. Ideal for smaller work places or single floors in care homes, this high-quality kit features all the items required in the event of a scald or burn in any environment. Presented in a durable and secure case, the entire kit can be screwed to the wall ensuring every member or staff knows where these items are located at any given time. The case is also coloured a bright orange tone to make identification and locating as easy as possible while a comfortable handle means that smaller work spaces can also store the kit under a table or on a specified bench. Gompels take health seriously and want to support you in keeping your staff, customers, and service users safe. Our First Aid & Medical Supplies section is full of a diverse range of medical supplies which covers most first aid and primary care needs, such as First Aid Kits, Gloves, and Antibacterial wipes.